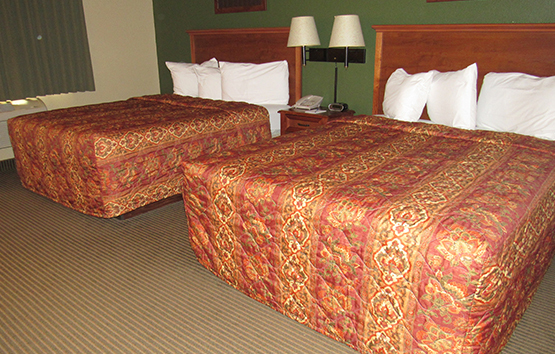 This 2 queen beds nonsmoking room will hold up to 5 people with a maximum of 1 rollaway bed. This nonsmoking room includes high speed internet access, free local calls, free newspaper, refrigerator, hairdryer, cable and color closed-caption TV with movie channels and news or cnn, iron and ironing board, AM/FM alarm clock radio, coffeemaker, smoke alarm, table with chairs, tub & shower, air conditioning, telephone, and dataport. This non-smoking executive room features two queen beds, microwave, refrigerator, iron with ironing board, activity table with 2 chairs, wireless high speed internet access, cable TV with HBO, hair dryer, coffee maker with coffee amenities, free local phone calls and continental breakfast. 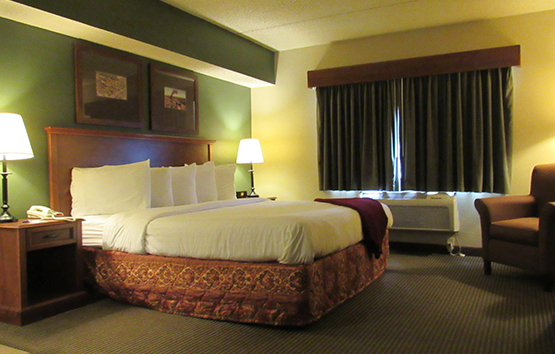 Quiet because every room is built with block and foam construction allowing you a more quiet night sleep. 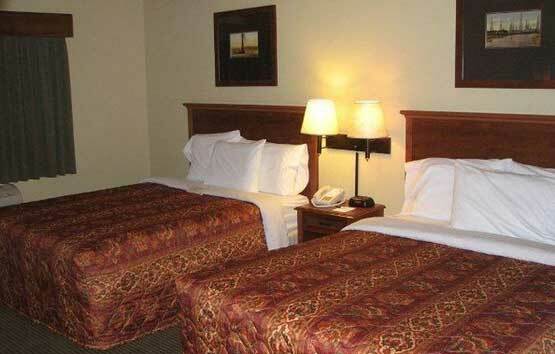 This non-smoking executive room features a king bed, easy chair, microwave, refrigerator, desk with chair, iron with ironing board, wireless high speed internet access, cable TV with HBO, hair dryer, coffee maker with coffee amenities, free local phone calls and complimentary breakfast buffet featuring Texas Waffles. Plus our rooms are extra quiet. Quiet because every room is built with block and foam construction to give you a more quiet night sleep. This non-smoking 1 room suite features a king bed, a two person whirlpool nestled in the corner, full size sofabed, coffee table, microwave, refrigerator, desk and chair, iron with ironing board, wireless high speed internet access, cable TV with HBO, hair dryer, coffee maker with coffee amenities, free local phone calls and continental breakfast. Plus our rooms are extra quiet. Quiet because every room is built with block and foam construction allowing you a more quiet night sleep. This non-smoking 1 room suite features a king bed, a two person whirlpool nestled in the corner, a private fireplace, full size sofabed, coffee table, microwave, refrigerator, desk and chair, iron with ironing board, wireless high speed internet access, cable TV with HBO, hair dryer, coffee maker with coffee amenities, free local phone calls and continental breakfast. Plus our rooms are extra quiet. Quiet because every room is built with block and foam construction allowing you a more quiet night sleep. 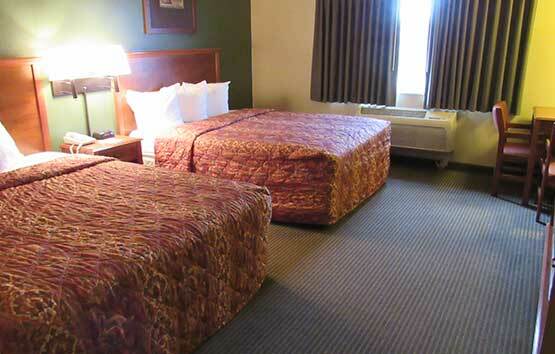 At the Borger Ambassador Inn, we offer spacious, comfortably furnished rooms and spacious suites. 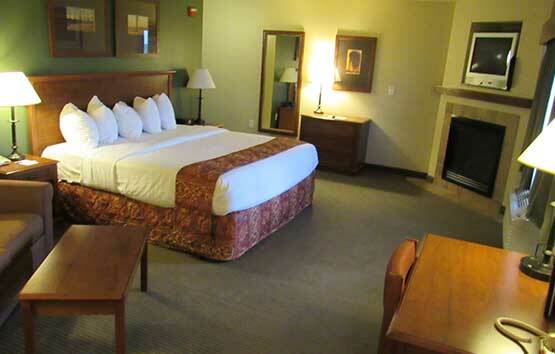 Our guest rooms are completely smoke free and we have provided a designated area for our guests that smoke. All of our rooms are equipped with microwaves and refrigerators and some rooms and suites provide an in-room whirlpool. 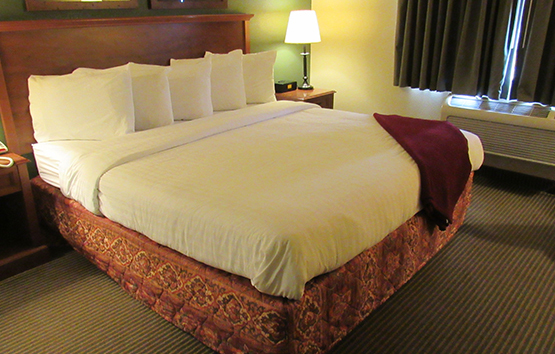 Choose from our standard rooms that include one king or two queen beds or spread out in our two room suites. Free wireless hi-speed internet. Can Cancel up until 6:00pm day of check in with no charge after that first night will be charged.